Part of my New Years resolution is to get a lot of painting done to support the games I intend to play. For the 35ID game I'll be using Tank Riders, which means I need a way to show them on the tanks. In the complicated hedgerow country of Normandy, traffic was notoriously bad and the going incredibly slow. To keep up and reduce traffic on the roads, some US infantry regiments used their tanks as transports. This increased the survival for both the infantry and tanks as they crashed through the bocage. Some divisions, such as the 35th, took this to heart and actually incorporated tank-riding tactics into their training. The 83rd did the same on the rush across and beyond the Rhine. In fact many of Patton's infantry divisions did, which is somewhat unsurprising considering the Third Army commander's aggressive posture. As the war continues on to Berlin, more and more divisions became quasi-mechanized, a famous example being the 5th Infantry Division. 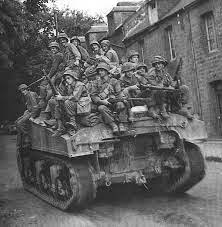 Anyway, with the imminent release of Bridge At Remagen, tank riders/escorts are about to become quite common. So I need some figures! The USO191 Tank Escorts pack is ideal for this sort of business. After buying a couple of packs, the only question is how to mount them on the tanks, permanently or removable. I permanently glued my Tankodesantiki to my IS-2s. It looks super cool, but they are prone to break off and get chipped a lot. However, in this case, the real problem is that it takes up a hull, so unless find the time and motivation to paint even more Sherman hulls (I have about 17 of each type as it stands), I'm going with the removable solution. Not ideal, but it means I can have options. My solution is not original and I've seen several variants of this. Simply put, I've cut out little 12mm x 12mm plastic card squares and put some green stuff on them. After cleaning up the miniatures, I've glued them down into the green stuff to stick them down tight. Once this is done, they'll get the paint brush treatment and we're off! I've got 12 of them to paint up now! I like them. I may wait for the plastic Sherman's then do some up with magnets hiding inside the hull. That's pretty genius, dude! I have been contemplating the fate of my current Sherman fleet with those plastics coming out... I may have to magnetize these riders if it's not too late! I did something similar with my Tankodesantiki. I used small squares cut from vinal magnetic sheets. The forward edge of the sheet tucks under the reat turrent overhang on my T-34's. Works OK. I've been thinking of getting some US tank riders just for the "cool" factor alone. Nothing beats StuGs w/Begleit for the "awesome" factor. Agreed! I think it adds a lot. I *may* end up permanently gluing them down to a few of my resin hulls if I replace my fleet with plastics... so many decisions! Mate of mine uses blu-tack for his Tankodesantniki...simple but effective. I think it pays to weight the tank down, so it doesn't become top heavy. Another great idea! I think I'll do that to keep them from sliding off. That's a smashing idea - they'll look great!